Two exciting things are mixed into this blog post today! 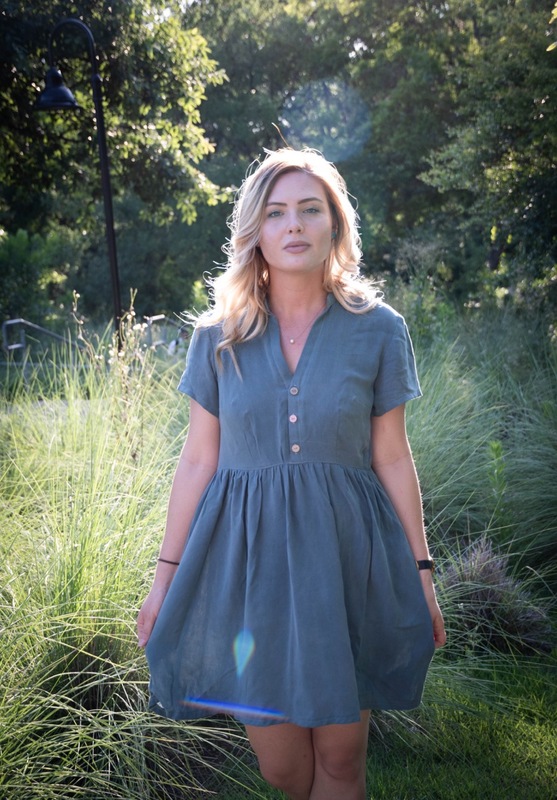 I’ve recently partnered up with Stylish Fabric, and I am so excited to be sewing with and showing off some of their beautiful fabrics a few times a year! This is my first affiliate post with them, and I’m super excited to tell you a little more about my fabric below! Secondly but equally important, happy Sew My Style May Reveal Day! This one was quite an intriguing mystery to all of us for the first few months of the year. 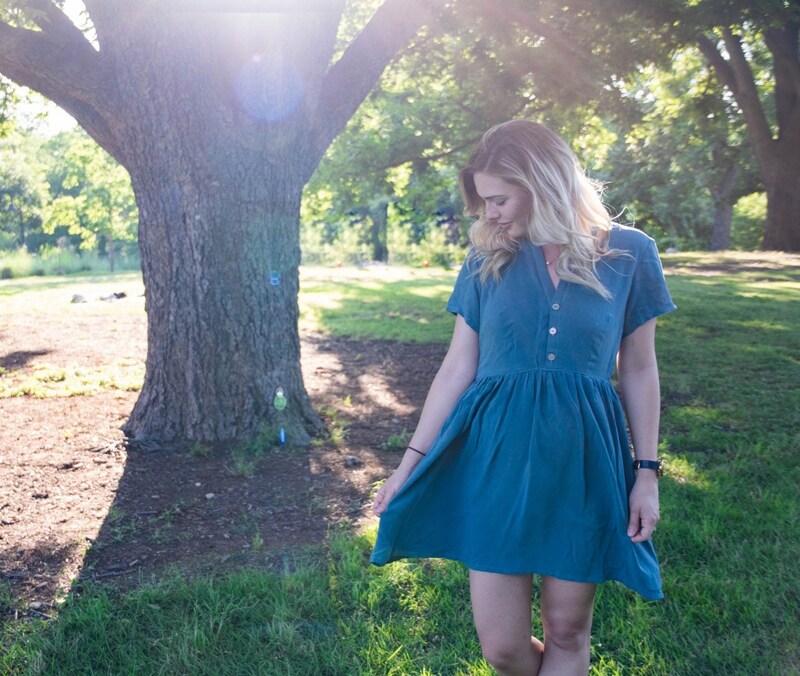 The Sew My Style Leader team was so excited to work with Deer & Doe by using one of their brand spanking new releases in our plans. Deer & Doe’s reputation as an incredible pattern company proceeds them, so we knew that whatever they designed, we’d be thrilled to work with! However, the suspense was a lot – as a chronic overplanner, I completely understood some of the anxiety participants were voicing about not being able to choose the perfect fabric and have it ready ahead of time, as they had no idea what we would be sewing! Once the pattern was released, and we were finally able to tell you guys what we’d be working on, I was pretty excited to make this dress up. It seems a lot of project participants felt the same way – I was so excited to see so many beautiful makes before the pattern had even been out for 10 days! The shape of this dress is a little out of the ordinary for what I might choose for myself. When I am looking at dresses, I gravitate towards those that nip in quite tightly at the waist to accentuate the waistline. I prefer things that are very fitted through the bodice, and am not always fond of how a looser, breezier silhouette like this looks on me. This is one of the things I love about Project Sew My Style, though – so far, I’ve ended up with a couple of really great garments in my closet that I may never have made for myself without the prompts! And quite honestly, I’m really (surprisingly) pleased with the way this silhouette is working on me! As usual, I prefer to make a pattern as it is designed when using it for the first time. I wanted something breezy and casual for summer, so I chose to go with Version B – the less frilly version. However, I absolutely love the frills and volume of Version A, and I’m thinking that I may have to extend the length and make a blouse hack of it for the late summer / fall season! 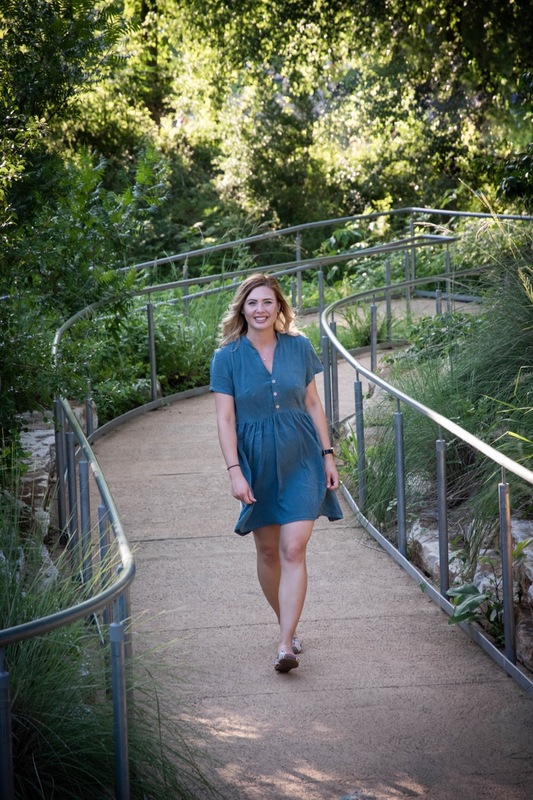 This soft and relaxed version was exactly what I’d envisioned, though – light and airy with sandals for summer, but will also take me through the cooler parts of spring and fall when paired with a cardigan or chunky sweater and boots. Okay, now on to the fabric! I wanted something lightweight and easy to wear in the summer, so rayon challis seemed like a great option. I love the look and feel of sandwashed satin, which I’ve worked with on a couple of different garments in the past, so I decided to try out this beautiful sandwashed rayon challis. As expected, I loved it. It is so soft and has the slightly sueded feel that comes along with the sandwash process. It comes in 9 or so different colors, this one is called teal denim. 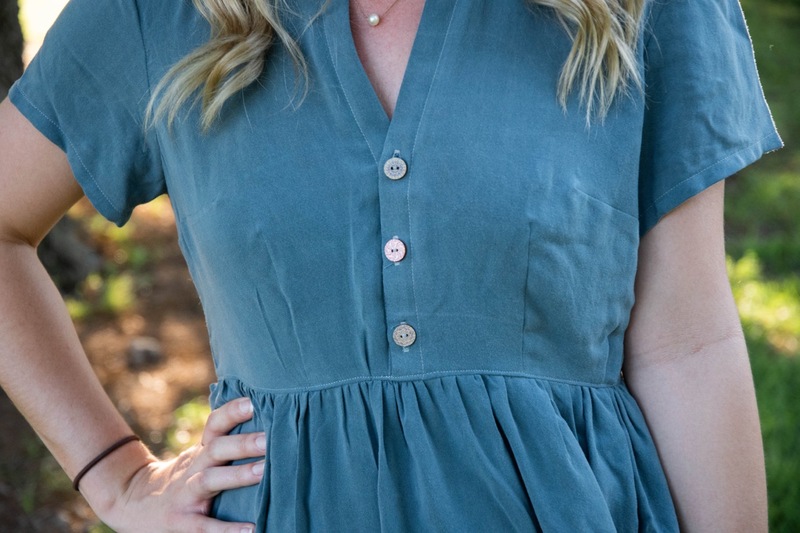 It’s the perfect intersection between blue, green, and grey, and it matches perfectly with the super cool buttons that I picked out for this dress before ever looking at fabrics! Thanks to the lovely team at Stylish Fabric, I’ve included a link below that will get you 20% off of this cool fabric (and as a bonus, I will get a little kick-back to fuel my sewing and blogging!) for the next 30 days! I’m convinced that this color would look good on anyone, and can truly be paired with just about any accent colors – I’m going to feel just as cute in my cognac leather boots in the fall as I do with these bright colored sandals in the spring! If you want to pick up some yardage of this for yourself, check out the link at the end of the post – it would make a lovely summer dress or blouse! As far as sizing for this pattern goes, I went with a size 38, which correlates pretty accurately with my pre-pregnancy measurements on the size chart. I knew there was a good bit of ease in the waist, and I figured I could get away with this size. Needless to say, my body is growing a little bigger in more areas than my belly, and this size fits pretty well right now – just a little bit of room in the bust and waist. However, I didn’t quite think through the fact that this is really a slip-over-your-head type of dress, and it does take a bit of a shimmy to get it over my shoulders! I think this will at least last me through the beginning of summer for now, and I know that I will love this soft material and loose silhouette again once the baby comes! So there you have it, folks – my take on the Myosotis and an awesome fabric recommendation from Stylish Fabrics. I hope everyone who tried out this dress ended up with something that they love as much as I love this one! It was well worth the anticipation for me. 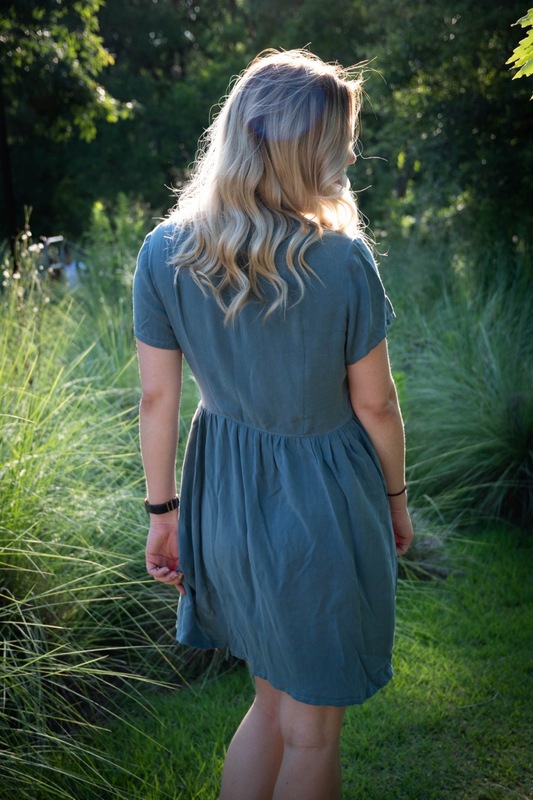 Fabric: Denim Teal – Sandwashed Rayon Challis from Stylish Fabric – you can use the code Elizabeth20 for 20% off of this fabric!